The third installment of the popular mobile racing series, launched in 2009 by Firemint. The game allows you to take part in more than 2,000 racing challenges in one of several different fun variations, offering an equally impressive number of real-world tracks and licensed cars. 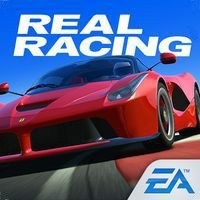 Real Racing 3 is the third installment of one of the most popular mobile racing series launched in 2009 by Firemint. The creation of the title is the responsibility of the Firemonkeys studio, created as a result of the merger of Firemint and Iron Monkeys teams, which resulted from the acquisition of both bands by Electronic Arts. The studio's credits include successful mobile conversions of the last installments of the Need for Speed series. The game allows us to take part in an impressive number of over 2,000 racing challenges, including classic cup races, time trials, one-on-one rivalry and drag races, as well as more sophisticated fun variants such as Elimination, Autocross, Speed Record, Speed Snap and Hunter. The authors reproduced 12 authentic race tracks, including Silverstone, Hockenheim, Le Mans, Laguna Seca and Dubai Autodrome, which can be traversed in several different configurations. A large range of nearly 100 licensed cars from manufacturers such as Ferrari, Porsche, Chevrolet, Lamborghini, Mercedes-Benz, Bugatti, Ford, Aston Martin, McLaren, Koenigsegg or Pagani has not been forgotten either. Our machines can be additionally modified, equipping them with special painting, stickers or rims. The game uses an interesting variant of asynchronous multi-player competition, described by the creators as Time Shifted Multiplayer (TSM). In this mode, we do not race against live opponents, but against the "ghosts" of other drivers, generated on the basis of their individual journeys. Unlike classic ghost races, we can interact with them, for example by pushing the opponent off the track. The distinguishing feature of Real Racing 3 is a realistic driving model and a graphic design based on an original Mint 3 engine, which wouldn't have been possible without a single title published on seventh generation stationary consoles. The title also works with older models of smartphones and tablets, but in order to fully enjoy the quality of graphics (detailed car models, rear-view mirrors or dynamic reflections), we will need really powerful equipment. For the first time in the history of the cycle, the game was made available in a free-to-play formula, which resulted in an extensive micropayment system, thanks to which we can unlock additional vehicles, routes and races, as well as repair damage without waiting.